New for version 5, VolumeShaper now runs inside Cableguys' exclusive ShaperBox creative effects rack. Use VolumeShaper on its own, or stack it up with other Cableguys Shapers to create elaborate, multilayered effects for your productions. 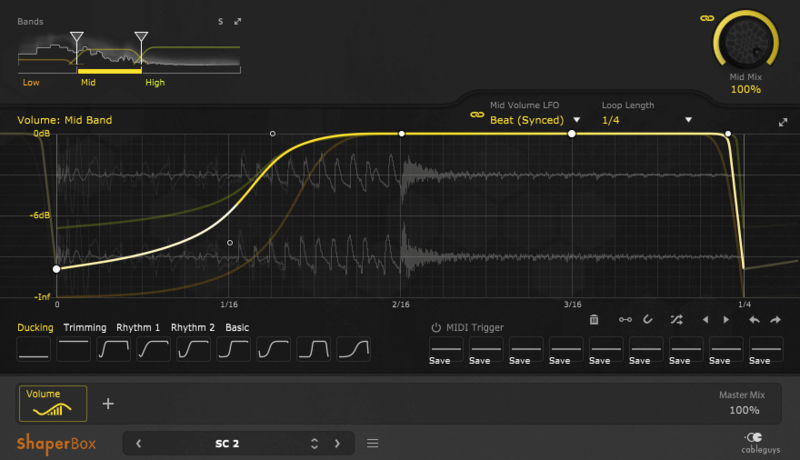 Take advantage of the new MIDI Trigger system to switch curves on the fly with the press of a MIDI key. And enjoy improved CPU and RAM efficiency along with even better-sounding interpolation. Try it out — download the demo and let VolumeShaper 5 loose on your audio productions. 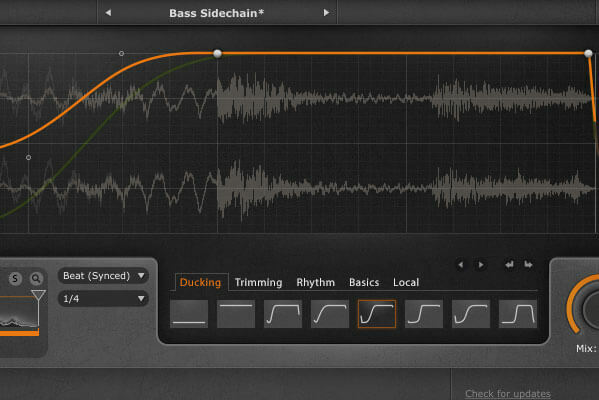 David Guetta explains how he tightens his kick and bass using VolumeShaper. Jauz talks producing "Goodiez" — see how he makes the bassline groove with VolumeShaper. Sometimes you find a drum loop that's perfect... except for the hi-hat! Here's how to remove off-beat hats using VolumeShaper 5. VolumeShaper demonstrated in 1 minute. The video shows VolumeShaper 4, but is fully relevant for v5 too. Computer Music magazine explain every VolumeShaper feature in this deep hands-on video. Learn how to add groove and make drums more realistic in this tutorial from Reid Stefan. I'm working on my album and VolumeShaper is on half the channels of every song, no joke. I use it for a variety of sidechain compression effects on mainly synths and drum loops, and it's easy to experiment with different rhythms of the compression. VolumeShaper is an exciting tool in my arsenal; acting as an envelope designer to really hone in on the dynamics and punch of a song. It's also the perfect sidechainer, I've always ended up taking ages to get my compressor attack and release times right when sidechaining. VolumeShaper gets the perfect result pretty much immediately. Then there's also the more creative uses, triggering the gate with syncopated MIDI, drawing a mad wave for glitchy modulation... glorious. Very very recently I've found a way to do it that is really amazing, I actually did it here... the sidechain that I am using with the bass is something that is called VolumeShaper. VolumeShaper is invaluable for getting drum sounds in my mixes. For my rock, alternative and indie mixes, I send MIDI notes from my kick and snare tracks to VolumeShaper with its LFO set to 'Fixed 1-Shot'. So VolumeShaper gets triggered when a kick or snare hits. This allows me to use it as a precision noise gate with a programmable envelope. Finally I'm able to shape drums any way I want. VolumeShaper is my most used plugin — I have an instance on practically every channel of every song I produce, for sidechaining using MIDI triggers. It's great to have multiband sidechaining available in a clear non-bloated interface, with an amazing envelope workflow. The curve system allows for quick, precise and smooth envelope creation. It's definitely the most powerful and versatile option I could find for sidechaining purposes. Save a massive 54% compared to individual prices! Subscribe for relevant product updates, tips and discount offers. We will never share your email address, and you can unsubscribe at any time. The demo is fully functional and has no time limit, but you can only use one instance per song and you can't save your settings. If you like what we do, we're happy if you follow us on Facebook or Twitter. And we're always glad for a +1 on Facebook. Thank you! During the payment process, you will be asked to enter your email address. Your unlock key will be sent to this email address. Transactions are handled through Share-it. No login required. Log in for upgrades (including Bundle upgrades). Includes a free copy of FilterShaper Core, worth €29 / $34! Transactions are handled through Share-it. Your unlock key will be sent to the email address that you enter during the payment process. Includes €29 / $34 money-off coupon for FilterShaper 3! FOR A LIMITED TIME: Contains free copy of HalfTime. On any questions, please check our FAQs first — maybe the answer is already there. On any technical issues, please let us know which operating system, which Cableguys plugin and which DAW you're using, and if you're running your DAW in 32- or 64-bit.